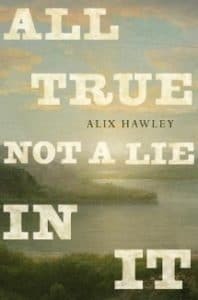 Like its narrator, Alix Hawley’s All True Not a Lie in It is a force to be reckoned with. This dream-like, gorgeously written first novel gets inside the head of Daniel Boone, America’s near-mythic trapper, woodsman and “white Indian.” If you know anything about Daniel Boone, you know he was most at home in the wilderness and that he was no stranger to violence. But Hawley explores the idea that he was also as layered and deep as the valleys he called home. All True Not a Lie in It is not light reading. Relying on poetic language seemingly at odds with his roughshod life, Boone wants to set the record straight: he doesn’t wish to be hailed as a legend, because there’s little glory to be found in his days of toil, loss, and bone-chilling hard work. The novel begins with Boone as a teenager in Exeter, Pennsylvania. It’s 1750, and he and his family are reviled in their Quaker colony. There’s talk of whores and lust, and we learn straightaway that Boone has no tolerance for the judgment of religious leaders. “The truth is all that we seek in this life. Confession makes us new,” his family is told at Meeting. Boone would rather head out into the backwoods and club a raccoon. For someone who is so outwardly ruthless, Boone grows into a man who is haunted by ghosts and his conscience. To me, these are the most riveting moments of Hawley’s book—when he scuffles with his humanity and grief, trying to reconcile his questionable actions with the responsibilities and love he has for others. The novel, which ends when Boone is in his mid-40s, requires an investment of time and attention, but the reader is amply rewarded, even as we encounter a few choppy, confusing chapters and drawn-out “let’s get on with it” scenes. I tend to grasp history best when I view it through the lens of fiction, and this alone makes All True Not a Lie in It a standout. I’m not sure how much of the novel is factually accurate—nor do I care—because, more than anything, it offers a broad, unflinching look at our nation’s history during a turbulent time. The costs of survival, the links of brotherhood, the sorrow over those who have been lost: these are the meaty themes that affect Boone and his contemporaries, whether British, French or Native American.